Human Resource Development Minister Smriti Irani on 30 September made a pitch for promotion of Sanskrit and making it a language of the masses by simplifying it in schools and holding more research in the discipline. The Union minister also said that as the Sanskrit is language of yoga, students from the discipline should exploit the growing interest for yoga world-wide. "All the Sanskrit universities should also generate yoga teachers," she said. "If we want to make Sanskrit a language of the masses, it should be promoted in simple standard Sanskrit," Irani said at the fifth convocation of the Rashtriya Sanskrit Sansthan in Delhi. The teaching of Sanskrit should be evolved with the contemporary requirements and modern technology be used in its promotion, she underlined, adding the course curriculum should also be "refined". Utilising the Massive Open Online Course (MOOC) platform and with the adoption of modern technology, the language can be promoted in the country and Sanskrit prose and dramas can be made available to students at minimal rates, she said. Talking about her vision for Sanskrit for the next ten years, Irani said each state should create at least two to three scholars in the discipline. "Teachers, who can impart the language in a simple way from the secondary to the higher education level, should be trained," she said. 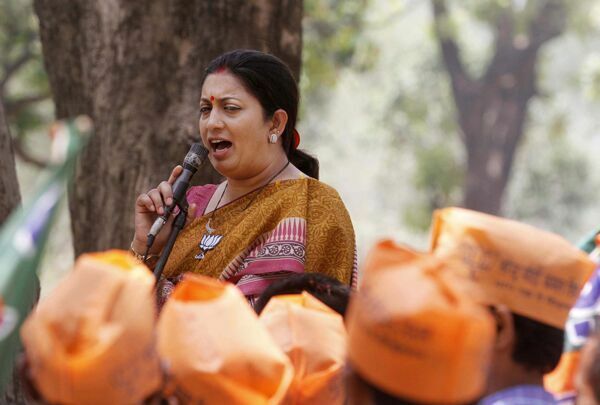 The language should be re-established in Sanskrit schools, Sanskrit universities and Sanskrit departments, she said. Irani called on the Sanskrit scholars and students enrolled in Sanskrit institutes to think beyond teaching and explore career opportunities in other sectors as well. The minister also appealed to the Sanskrit scholars to engage and develop literature that reflects today's society. More and more research should be conducted in the discipline so that it benefits the common man and is useful for the future of the country, she said. Laying stress on greater promotion of Sanskrit, the HRD Minister said if Sanskrit has to become a popular language there is a need to develop standard Sanskrit, otherwise it will remain only a language of a few scholars. Observing that the standard of Sanskrit teaching should also be improved, she said it should be taken to non-Sanskrit area of studies and standard of textbooks should be enhanced. Noting that BR Ambedkar had desired to make Sanskrit the national language, Irani said though the proposal did not go through in the Constituent Assembly, it was accepted in the Chapter 4 of the Constitution that for the usage of Hindi as the national language, the vocabulary should be drawn mainly from Sanskrit. She also laid stress on using the Internet to spread Sanskrit to every village and the furthest corners of the country. "Being the language of Yoga, Ayurveda and Vedanta, Sanskrit now spans across the world. Sanskrit belongs to all. This is a language that unites the country," she said.